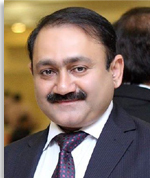 Dr. Sayyid Salman Rizavi is serving as Director General and Associate Professor at the University of the Punjab Gujranwala Campus. He has earned PhD in Economics from University of Paris 1, Panthéon-Sorbonne, France. Prior to his PhD, he did Master in Quantitative Economics, University of Paris 1, Panthéon-Sorbonne, France, Master in Computer Sciences from University of the Punjab, Lahore (Pakistan), Master of Philosophy in Economics (M. Phil) from Quaid-i-Azam University, Islamabad (Pakistan) and Master in Economics from University of the Punjab, Lahore (Pakistan). He has more than 22 years of teaching and research experience. He has taught a range of subjects in the field of economics including Micro Economics, Macroeconomics, and Econometrics at graduate and postgraduate level. He has numerous research papers in well reputed international journals and presented in international conferences held at France, Germany, Hungary and Italy. He is also author of a book “Introduction to Economics”, approved and recommended by Higher Education Commission in Pakistan for graduation level in Commerce. In addition to this book he has also contributed a chapter in a book in French Language: Travail et Genre; Regards Croises France Europe, Amerique latin : Chapitre: Travail domestique et organisation des temps de vie dans les ménages : une comparaison international, (Language: French), La Decouverte, Paris, 2008. He is also author of “Travail domestique et organisation des temps de vie dans les ménages : une comparaison internationale” , Colloque Marché du travail et genre : comparaisons BrésilFrance (Language: French), MAGE, Documents du travail n-10, Paris, France, 2008. He has supervised number of Master and M.Phil theses in the area of Economics and Management Sciences.